Velveeta has arrived on the frozen food aisle of grocery stores for the first time. 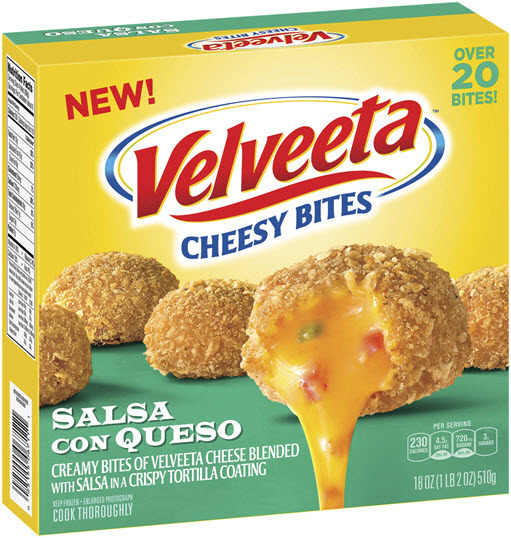 The new frozen snacks are Velveeta Cheesy Bites from Kraft Heinz. There are two new frozen foods products available. The flavors are Velveeta Stuffed Grilled Cheese and Velveeta Cheesy Bites. The Cheesy Bites come in two flavors: Original and Salsa con Queso. The Salsa con Queso features a flavor based on the Velveeta Queso dip recipe. Velveeta says the Velveeta Stuffed Grilled Cheese item is microwavable in one minute. It comes in boxes of two or six sandwiches. The Cheesy Bites come in 6 oz. or 18 oz boxes. They all retail for $4.99 a box. 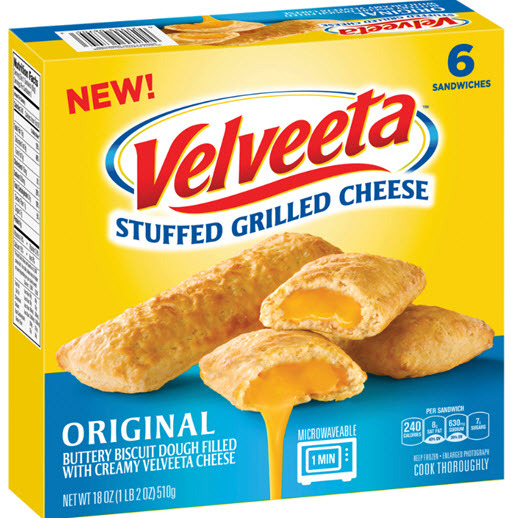 Caio Santos, Brand Manager for Frozen Snacks at Kraft, says in a statement, "As an iconic American brand, we believe Velveeta will bring excitement to the Frozen aisle. These are convenient frozen snacks that capture the true Velveeta experience, Liquid Gold taste and melt. From weekend entertaining to an after school treat, our bites and grilled cheese are cravable for every Velveeta lover out there." The Cheesy Bites are already listed on walmart.com. They contain 230 calories and 24 grams of carbs per serving size (4 bites).